While St Helena has no native land mammals and only one endemic land bird, it is a major hotspot for invertebrates, with around 470 endemic terrestrial species. Invertebrates on St Helena are threatened by invasive plants and animals, reduction and fragmentation of habitat, and infrastructure development. 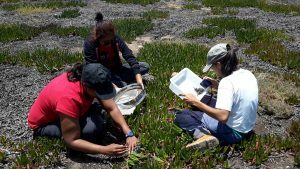 Efforts to conserve endemic plants and habitats have been underway for a number of years, but there has been little focus on the rich invertebrate fauna of the island. The St Helena National Trust is the leading conservation organisation on St Helena and has undertaken an ambitious three-year project to attempt to conserve and protect the island’s invertebrates. A wide-ranging invertebrate survey has been conducted across the island, using over 20 malaise traps at varying sites across the island. Other survey techniques were also employed and experts also visited to undertake fieldwork on specialist groups. 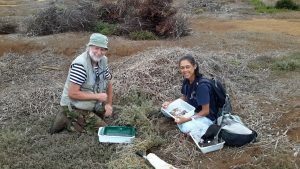 The major habitat types on the island were surveyed over a year, making it one of the most comprehensive invertebrate surveys ever attempted on St Helena. 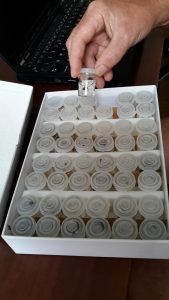 A complete set of resources including taxonomic keys, photos, wet and dry collections, and microscopes and laboratory tools have been assembled which will ultimately be housed at the Museum of St Helena so that terrestrial invertebrate identification and research can be undertaken on-island after the life of the project. A field guide to St Helena’s invertebrates is being written and will be published soon. Red Listing of endemic invertebrates has been undertaken as part of the project, and more will be added and updated beyond the life of the project. The Darwin plus funded project ended in June 2018, but invertebrate work continues with our experienced staff. The previous “Bugs on the Brink” project outreach program has been a great success and has engaged over 500 children on St Helena. One of the aims was to create an educational invertebrate resource “loan box” for teachers to give them resources, including documents and equipment, to conduct invertebrate lessons based on the curriculum. The loan box documents consist of six booklets and cover subjects such as science, one of the main areas in which invertebrates can be covered in the curriculum, and gives information on a wide variety of lessons such as food chains and webs, classification, reproduction and habitats, to name just a few. Other documents in the loan box include worksheets, equipment, activities, crafts and games which are also related to science and the curriculum.